This article contains information on the geographical location of Udaipur, India. Grab more on Udaipur's geography. The city of Udaipur is located in Rajasthan, a state in the Northern part of India. The city of lakes would have joined the Thar Desert, if the Aravalli Range has not separated them. Udaipur lies at the southern end of the Aravalli Range. For Udaipur, Aravalli Range is an important relief feature and it is often perceived as a frontier that separates the Thar Desert from the plains and plateaus of eastern Rajasthan. 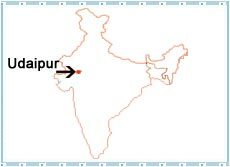 In the language of geography, Udaipur runs from latitude 24.58 degrees in the north to longitude 73.68 degrees in the east. The city covers an area of 37 sq kms and lies at an altitude of 598 m above sea level. Mentioning about the geographical location of Udaipur, India, the city is sited in the southwest of Jaipur, near the border of Gujarat. Being situated in a desert area along with lakes, Udaipur usually remains sultry. Udaipur, the city of lakes lies at a comfortable distance of about 663 kilometers from Delhi, 637 kilometers from Agra, 620 kilometers from Gwalior, 797 from Mumbai and 405 kilometers from Jaipur. Udaipur is well-connected with Mumbai, Delhi, Jaipur and other cities of the country by air, rail and road.